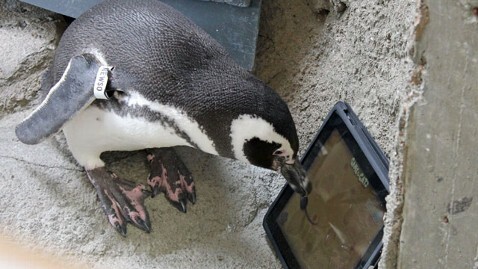 Spring is in air at the Aquarium of the Pacific in Long Beach, Calif., and while many penguins are preparing for mating season, two coming-of-age birds found another form of entertainment: An iPad game. Still too young to mate, Jeremy and Newsom seem to have taken quite a liking to the free iPad app called, " Game for Cats," the aquarium said in a blog post. The game, which the aquarium said is used as "enrichment" for the youngsters, shows a virtual mouse that darts up and down and all around on the screen. When the mouse is hit - by paw or by beak - it squeaks. 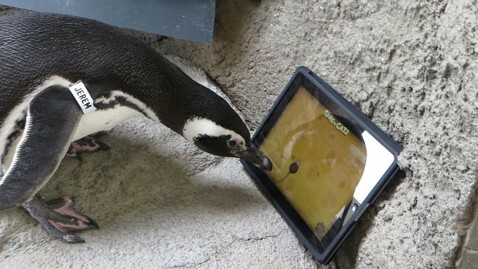 When aquarium officials placed an old iPad inside the June Keyes Penguin Exhibit, Jeremy and Newsom, curious, waddled over to it. Jeremy was the first to try pecking at the mouse with his beak, the aquarium said, but it was Newsom who put on his game beak and really took a liking to the app. In a video the aquarium posted, Newsom could be seen cocking his head as he stalked the virtual mouse, pecking away and increasing his gaming fervor when he made the mouse squeak. 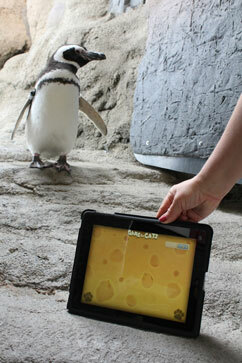 "Newsom set the penguin high score of 1,600 for the game," the aquarium wrote. According to the Los Angeles Times, the $1.5-million, 3,000-square-foot penguin exhibit debuted last year and features a colony of Magellanic penguins.